We are printing here two short translations. The first is from the KAPD in 1923. Those with an eye for history will recognise the date as the year of, not only the Nazis’ failed “Beer Hall Putsch” in Munich, but also the year when the German Communist Party adopted National-Bolshevism in an attempt to win over workers who had been seduced by the nationalist extreme right. The so-called “Schlageter Line” (named after a Nazi shot by French occupying troops) was just one more piece of evidence of the utter political bankruptcy of the KPD and the Comintern as it stood face to face with a growing counter-revolution. The KAPD leaflet is a document of its time and it is also not a scientific treatise. It therefore does not question the nonsensical concept of “race” as we would do today, but it nevertheless deals with nationalism and racism head on and in a principled internationalist fashion. In some ways the leaflet with its talk of scapegoats and populism could be talking about today. Substitute “Migrants” for “Jews” and the internationalist proletarian message is essentially the same as that in the short leaflet our Italian comrades distributed amongst workers on strike and in demonstrations earlier this month. Race War or Class War? The Jews are to blame for everything! We are getting this hammered into our ears wherever we go. The Jews are responsible for the war, the Treaty of Versailles, the occupation of the Ruhr, rising prices for consumer goods, unemployment, corruption of the workers' parties and trade unions. In short, for every misfortune, for every event, there is only one guilty party: the Jew. If someone slips on something and breaks a leg, that does not matter, it's the Jew's fault! There used to be an insignificant political group in Germany, which, in order to hide its own follies, transformed the Jew into a scapegoat. And today? Unfortunately, these stupid arguments have taken root deep in the ranks of the working class. The nationalist stupidity of our younger generation in the schools and older workers during the war and the revolution has paved the way for them. The workers' organisations have overlooked this problem and have unwittingly promoted this propaganda. So today we face the danger of a race war. Appropriate organisations have already been set up (National Socialists in South Germany, German Freedom Party in Northern Germany). This warning of danger ahead does not just concern the Jews themselves. We should expect not only pogroms against the Jews, but also the enslavement of the workers in the interest of Capital. “Capital? That’s the Jews”, respond the advocates of these parties pointing to the unemployed as proof. Oh, no! There are certainly some Jewish capitalists, but the capital that counts the most is in the hands of Messrs. Stinnes, Thyssen and Krupp, all three of whom are allegedly "Christians." Whatever. Our struggle must not be against individuals, but against a class. Not against the members of this class as human beings, but against the economic and state system directed by them. Our struggle is not about their lives. What is at stake is a change in the means of production, the transformation of private property into collective ownership. For this reason, it doesn’t matter whether the capitalist is a Christian or a Jew. Capital is our enemy and not those who belong to this or that religion or this or that race. Workers, open your eyes! They want to inject this pogromist virus directed against the Jews into your minds. They only want to divert you from your goals, using the method of shouting: “Stop thief!”. But do not be fooled. We are all the same race, whether we are Germans, Slavs, Latins, Mongols, or Semites. In each of us flows the same red blood that makes us brothers. Moreover, as workers, we have absolutely no reason to be populists. Our sufferings, under identical conditions, are absolutely the same, regardless of race or nationality, and it is only by acting in common that we can liberate ourselves. So do not succumb to lies, do not be fooled. Your enemy is not the Jew, but Capital. It is not the struggle between races but the class struggle that opens the way to freedom, that is the way out of poverty. (Der Arbeitslose, organ of the German Action Committees (inspired by the KAPD in Berlin), No. 1, 4, May 1923, Berlin. Italian and immigrant proletarians are one class! In recent years, the struggles of immigrant workers in logistics, agriculture and other sectors have been very important. Thanks to these struggles, their conditions are often improved. 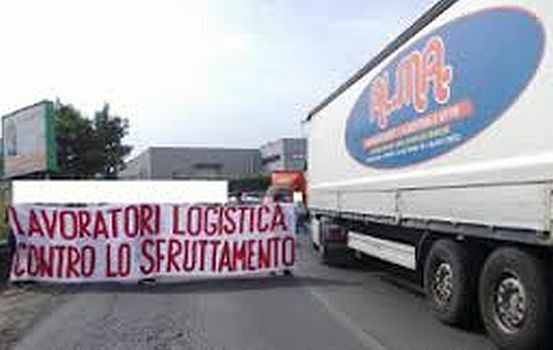 But to think that thanks to isolated struggles alone we can arrive at a general improvement of working conditions, and thus life, for casual Italian workers and immigrants, is an illusion. Global capitalism is in crisis; the bosses respond to the crisis by squeezing wages, creating precarious working conditions and by cutting the "Welfare State"; increasing global competition drives competition between the imperialists and with it grows the devastation of the globe; the growing masses of humans fleeing from their home countries to find work in the West; the bosses take advantage of immigration to further reduce labour costs and try to offload the new social tensions onto immigrants by stoking the fires of nationalism, populism, racism. fight for a new social order, for a world without classes, without exploitation, without wars, without borders. This programme is not only possible, but necessary. The first step is that the more aware people begin to grapple with this perspective of the problems we face – something which today is not taking place in practically any political or trade union group. We Communist internationalists fight for this and encourage you to develop our point of view, to take on the perspective of the need to build the revolutionary organisation. We have a world to conquer. Let’s go for it. For a new social order, for a world without classes, without exploitation, without wars - so far so good, whether or not that can be achieved, but in so far as workers do have (and I quote:) 'their home countries', at that point it seems to me that there must be questions and doubts. Workers do not like the 'home countries' where they still live, or used to live, to be overrun and occupied by numbers of invaders, whether or not there are explanations of why that occurs. Just because \Marx said something, that doesn't mean that what he or anyone else said should be accepted now without reconsideration as to the validity and relevance of it. Marx and Engels said that workers have no country and should unite worldwide, but they did not say that large numbers of them should converge on other places in order to do so. There is a considerable difference between jingoist imperialist nationalism, as distinct from workers' affiliation with and knowledge of their 'home countries' where, from childhood, they learn their local language(s), customs and so on. These facts are not racist, because they would apply even it the entire world population all only had one skin colour. Actively encouraging workers to move to other 'home countries' , when circumstances there are unfavourable anyway, seems likely to produce all the reactionary views which CWO opposes. Trying to teach properly in classes in which large numbers of students have any number of original languages in underfunded schools needs to be considered by all those who advocate 'no borders' whatsoever today. A total lack of borders seems more likely to produce sheer chaos rather than world socialist peace. Socialists will need to make sensible arrangements rather than just keep chanting old mantras like Trotskyists. The mass protests in the USA , UK and worldwide against the policies of Trump have made me think again about my comment of 2016-12-18. Did I hear someone say "About time too !"? These times seem to be more convulsive ideologically than albeit complicated former ones, for workers everywhere. If now assuming that communism = no borders, refugees, or deportees, a dialectical interplay between objective and subjective considerations requires ongoing attention.